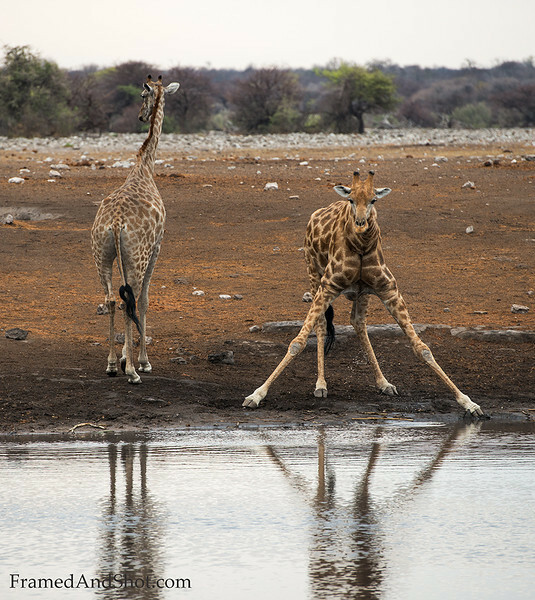 To drink water giraffe have to adopt a very ungainly position with legs widely spread. This places them in a position of extreme vulnerability to predators for it requires much effort and precious time to get into this position and regain an upright posture when they have finished drinking. Giraffe seem to be aware of this because they are very circumspect before they actually commit themselves to taking up the drinking position and will stand for a long time at a waterhole carefully observing the surroundings before they will finally move to the waters edge and drink. Having to lower the head to a position much lower than the heart also presents unique physiological challenges.